“No: France Is Not Bankrupt” – Really? "The emotional side of me tends to imagine France, like the princess in the fairy stories or the Madonna in the frescoes, as dedicated to an exalted and exceptional destiny. Instinctively I have the feeling that Providence has created her either for complete successes or for exemplary misfortunes. Our country, as it is, surrounded by the others as they are, must aim high and hold itself straight, on pain of mortal danger. In short, to my mind, France cannot be France without greatness. Recently there have been a spate of horrific train wrecks in the news. Almost inevitably we find out there was human error involved. Almost four years ago I began writing about the coming train wreck that was Europe and specifically Greece. It was clear from the numbers that Greece would have to default, and I thought at the time that Portugal would not be too far behind. Spain and Italy clearly needed massive restructuring. Part of the problem I highlighted was the significant imbalance between exports and imports in all of the above countries. In the Eurozone there was no mechanism by which exchange rates could be used to balance the labor-cost differentials between the peripheral countries and those of the northern tier. And then there's France. I've been writing in this space for some time that France has the potential to become the next Greece. I've spent a good deal of time this past month reviewing the European situation, and I'm more convinced than ever that France is on its way to becoming the most significant economic train wreck in Europe within the next few years. We shifted focus at the beginning of the year to Japan because of the real crisis that is brewing there. Over the next few months I will begin to refocus on Europe as that train threatens to go off the track again. And true to form, this wreck will be entirely due to human error, coupled with a large dollop of hubris. This week we will take a brief look at the problems developing in Europe and then do a series of in-depth dives between now and the beginning of winter. The coming European crisis will not show up next week but will start playing in a movie theater near you sometime next year. Today's letter will close with a little speculation on how the developing conflict between France and Germany and the rest of its euro neighbors will play out. I think I need first to acknowledge that the market clearly doesn't agree with me. The market for French OATS (Obligations Assimilables du Trésor), their longer-term bonds, sees no risk. The following chart is a comparison of interest rates for much of the developed world, which I reproduce for those who are interested in comparative details. Notice that French rates are lower than those of the US, Canada, and the UK. Now I understand that interest rates are a function of monetary policy, inflation expectations, and the demand for money, which are all related to economic growth, but still…. France's neighbors, Italy and Spain, have rates that are roughly double France's. But as we will see, the underlying economics are not that much different for the three countries, and you can make a good case that France’s trajectory may be the worst. "No: France Is Not Bankrupt" – Really? No, France is not bankrupt .... The claim is untrue economically and financially. France is not and will not bankrupt because it would then be in a state of insolvency. A state cannot be bankrupt, in its own currency, to foreigners and residents, since the latter would be invited to meet its debt by an immediate increase in taxation. In abstract, the state is its citizens, and the citizens are the guarantors of obligations of the state. In the final analysis, "The state is us." To be in a state of suspension of payments, a state would have to be indebted in a foreign currency, unable to deal with foreign currency liabilities in that currency…. Ultimately our leaders have all the financial and political means, through the levying of taxes, to be facing our deadlines in euros. And besides, our lenders regularly renew their confidence, and rates have never been lower. Four things leap to mind as I read this. First, Professor, saying a country is not bankrupt because it would then be insolvent is kind of like saying your daughter cannot be pregnant because she would then have a baby. Just because something is unthinkable doesn't mean it can't happen. Second, contrary to your apparent understanding and the understanding of your partners in the Eurozone, especially Germany, France does not have its own currency. The Greeks, Portuguese, Italians, and Spanish have all found out that they cannot print their own currencies, no matter how much they wish they could. You are all bound up in a misguided economic experiment called the euro. Deal with it. For all intents and purposes you are in fact indebted in a foreign currency. On your current path you will soon have to go to Germany and the rest of Europe asking for a special dispensation simply because you are France. If this development weren't so potentially tragic, with horrific economic implications for the entire world, it would be especially amusing theater. Third, I find the use of the term invited in the phrase "invited to meet its debt by an immediate increase in taxation" to be quite a wonderful French expression. Your tax rates are already among the highest in Europe. At a 75% top tax rate, your entrepreneurs and businesspeople are leaving the country in droves. That icon of economic enlightenment, tennis star Serena Williams, recently commented in Rolling Stone magazine that "75% doesn't seem legal." Gerard Depardieu and many others not quite so famous agree and have already left. You are going to collect less, not more, taxes from the rich with your remarkably ill-considered increase in the top tax rate. Just look across the channel to England and see how their raising their top rate merely to 50% worked out for them. Fourth and finally, you clearly haven't done your homework on economic crises. The fact that your interest rates are low and that your loans routinely get rolled over simply says that you have not yet come to your own Bang! moment. Every country that falls into crisis is able to get financing at low rates right up until the moment it can't. It is all about investor confidence, and I readily admit that right now you have it. But through its policies the current government is doing everything it possibly can to destroy the confidence of the bond market as rapidly as it can. And France is particularly dependent upon non-French sources for the financing of its debt. Your country is in recession and has been for almost two years. Even the government is beginning to acknowledge that growth is and will be flat. Standard & Poor's thinks your growth rate may be as low as -1.5%. Jean-Michel Six of Standard & Poor's recently noted, "The current account deficit is growing month after month, and this means it is depending more and more on the rest of the world to finance its growth. In my view, France has got just one more year to sort itself out." One of the ways to deal with a debt crisis is to grow your way out of it. You are not doing that. The number of new industrial plants created by foreigners fell 25% last year, and new job creation fell 53%. Ernst & Young said France's anti-market body language had become almost "repulsive" to outside investors, and a series of bitter labor disputes has not helped (source: The Telegraph). French industrial output is still falling, and both your manufacturing and service PMIs are among the worst in Europe—far worse even than those of Italy and Spain, both of which are clearly in financial disarray. The following PMI chart is from March, but August was still in negative territory (chart courtesy of Josh Ayers of Paradarch Advisors). Your debt growth is unsustainable. France is currently enjoying the lowest effective borrowing rates it has had for 30 years, allowing the interest you pay to fall even as the total debt rises. Both interest payments and interest as a percentage of GDP are at all-time lows. France is approaching the point in its debt expansion phase in which debt service costs will rise faster than incomes causing a squeeze. The below charts convey that in brief. They show France's debts rising relative to incomes while interest rates fell so that debt service expenses fell relatively despite the greater debts. When debt service expenses fall relative to income, that leaves more money for spending which is stimulative for the economy. Both the risk-free rate and credit spreads have fallen just about as far as possible. As a result, the net relief in debt service payments that has come from the interest rate decline will be removed. If interest rates rise, particularly if both the risk-free rate and the credit spreads rise, the debt service bill will have to increase more. That means that either (a) debt service expenses will increase as a share of income, thus squeezing consumption and lowering economic growth (b) there will be an acceleration of indebtedness in order to pay for both the increased debt service requirements and increased consumption growth (which is a sure sign of an unsustainable bubble) or (c) incomes from some other sources have to rise. Since income growth is a function of productivity growth and competitiveness in global markets, and France is not doing much to improve productivity and competitiveness, we do not expect incomes to benefit from changes in these. That means that debt and debt service growth will either accelerate until the debt bubble pops or debt growth and economic growth will slow which will be painful. Since painful slower growth is not an option, it is more likely that debt and debt service growth will accelerate until the bubble pops. That will have important implications for the whole Eurozone. Your fiscal deficit this year is likely to be well north of 4%, far above the level specified in your commitments to the Eurozone. The budget watchdog of France, the Cour des Comptes, is calling for much deeper budget cuts than Mr. Hollande is proposing. The unions and government employees, as well as much of Mr. Hollande's party, are in very vocal rebellion. France deeply needs labor reforms to make itself more competitive, but there is simply no political will or ability to do so. Established in 1945, the French pay-as-you-go social welfare system is completely unfunded. The scheme (their word, not mine) has grown to preposterous proportions. 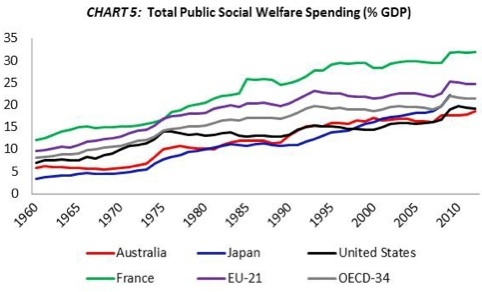 As seen in Chart 5, French welfare spending now outstrips the rest of the world by a considerable margin. How big is this contingent liability? Well, governments are kind of funny about medical transparency. While they covet the murky details of your entire proctological history, they don't like disclosing their own information—especially unfunded, off-balance sheet social obligations. In 2009, the ECB commissioned a report from the Research Center for Generational Contracts that sought to quantify the present value of both the government employer pension and social security schemes for each then-EU member. While their data terminates at YE2006, the report estimated that France had the largest total unfunded liability relative to GDP, at 362.2%, or EUR 6.5 trillion. As countless failed US defined benefit pension schemes have proved, pay-go is just another word for pyramid scheme. The scheme stays solvent so long as the payers comfortably outnumber the beneficiaries. But everything goes jackfu [note from John: That's a technical economics term] when the percentage of payers begins to contract. France is in a profound economic funk, and this is not the stuff from which significant recoveries are made. Consumer confidence in your country, Professor, was at a 40-year low in June. A recent study by the Pew Foundation said French support for the European Project has crashed from 60% to 40% over the past year. Just 22% now think EU economic integration is positive. The French unemployment level is at a 15-year high of 11.2% and has risen for 26 consecutive months. French youth unemployment stands at 25.7%. The IMF recently issued a report which suggests that the proposed economic reforms of Mr. Hollande do not go deep enough and will not cut unemployment from double-digit levels by the end of the decade. Foreign holdings of French debt are 50% higher than those for Italy and four times higher than those for Spain. As investors became concerned about Spanish and Italian debt, they rotated into over $1 trillion of French government debt on the assumption that the French debt was safer. The simple fact is that France can't print its own currency, so it is therefore dependent upon the kindness of strangers. Bridgewater estimates that if France were judged solely on its fundamentals, its spread to Germany should be about 3.5% rather than the current 50 basis points. If that kind of differential were realized by the marketplace, France would have no hope, under the current regime, of getting its deficit under 3%, let alone below nominal GDP growth, which is the more important number. Like the peripheral Eurozone countries, France has started to run a significant trade deficit. Without going into the math, in very general terms, you cannot reduce your debt and run a trade deficit the same time. That has been one of the key problems in Greece, Portugal, Spain, and Italy. Restructuring a trade deficit is painful in that it requires either a downward currency adjustment or a reduction in labor costs (or an increase in labor productivity). When currency devaluations are not possible, the adjustment is typically borne on the shoulders of workers in the form of reduced wages and layoffs. That of course means lower tax revenues and larger deficits, coming at a time when they are the most difficult to handle. France has simply become uncompetitive. New businesses are not being created, and existing businesses are leaving. Admittedly, Brussels has not been helping, with the imposition of a slew of new mandates that are increasing costs relative to the rest of the world. Google "French chicken crisis" and "French egg protests" to see why exports are down. French poultry exports have fallen from €1.2 billion to less than €200 million in about 10 years. I say all this with a heavy heart, because I really do love France. I love the French countryside and the history and the art and Paris. My numerous experiences in France have always been pleasant and have created many enjoyable memories. But the reality is what it is. You've run up debts, and now payment is due. So why does France enjoy such low interest rates? The simplistic answer is that the market simply doesn't see the risk. But then again it didn't see the risk in Greece or Italy or Spain prior to their crises, either. I think the catalyst could come during the latter part of this year or in the first half of 2014. There are two events that might serve. First, something has to be done very soon about Portugal. The Portuguese are going to need another infusion of capital. Their economy is upside down; their debt relative to GDP is still growing faster than income; and the simple fact is that they need to default on part of their debt. Call it debt forgiveness or apply whatever euphemism you want, it will be default. Otherwise, Portugal will slowly suffocate under the massive interest payments required to service its debt. The problem is that any haircut on the debt would put Portuguese banks (which are the largest holder of Portuguese debt) into insolvency. The only guarantor of Portuguese banks under the current structure is the Portuguese government, which means that in order to take a haircut on the debt it already owes to creditors, the government would have to borrow more money to give to the banks. They would be taking two steps backward for every step forward. After Cyprus, it is now apparent that the EU and the ECB are perfectly willing to see large depositors and subordinated bondholders of banks take rather large haircuts rather than assume a mutual liability. If the same principles are applied to Portuguese banks as were applied to those of Cyprus, it would make a bad financial situation in Portugal even more desperate. And yet if the ECB bails out Portuguese banks under some legal fiction, Cyprus would have a real justification for possible lawsuits. There are simply no good or easy solutions for Portugal without someone incurring a great deal of pain. But a Portuguese banking crisis would mean a run on Italian and Spanish banks. It is really that simple. Everyone was told, and the market obviously believes, that Greece was "one-off" and that no other country would need to take a haircut on its debt. If Portugal does, then the contagion factor that Europe was worried about with Greece will really come into play. If Germany and the other core countries allow Portugal to default in some manner, what does that say about their willingness to fund even larger sums for Italy and Spain? What will France do? Will it support further austerity for Portugal, or will the French argue for generalized European taxpayer support of Portugal (thereby implying that France should be able to access the same funding at some point in the future)? If private investors in Portuguese banks are forced to take losses, that will make Italian and Spanish bank depositors nervous. Anyone paying attention to French fundamentals will begin to question the current low interest-rate regime there as well. 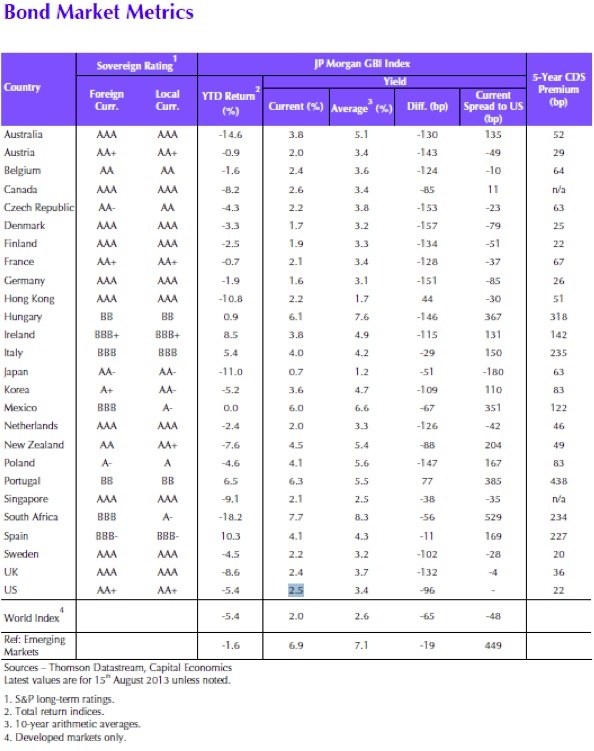 And then there are the European bank stress tests that are scheduled for early 2014. These have been postponed so that the ECB can do its own analysis, but the time for them is fast approaching. Regulators want to have a uniform methodology across the Eurozone for calculating bad loans, which will keep banks from using "local practices" to hide bad debts. Further, it is not yet clear how the new bank stress tests will treat sovereign debt. Heretofore, sovereign debt in Europe has been considered risk-free, and banks have levered up as much as 40 to 1 on sovereign debt. Portuguese banks, for instance, don't have to reserve against the purchase of Portuguese debt, and neither do Italian or Spanish banks when they purchase their own country's debt. Any modest restructuring of national debt will result in massive bank insolvencies, not just in the peripheral countries but throughout Europe. There is some talk of beginning to require reserves against sovereign debt, but this would mean that banks would have to raise significant amounts of capital in order to bring their required Tier 1 ratios into compliance. Good luck raising the tens of billions of euros that would be required in the present market environment. The bank stress tests that were administered a few years ago were a joke, and everybody knows it. It was all wink, wink and nod, nod and figure out how to finesse the obvious. In order to sustain any credibility, the next round of stress tests will have to be far more serious. How the new regulatory regime of the ECB deals with sovereign debt will to a great extent tell the world how serious they are about stress testing. After Greece, and after looking at the ongoing problems of Portugal and Spain (and especially Spanish banks), who can say with a straight face that there is absolutely no risk in sovereign debt? But if there is some risk, then there must be reserves against it. These two events—dealing with Portugal and undertaking the European bank stress tests—will focus the attention of the markets back on the fundamentals of European debt and the euro. It is quite possible that the French fiscal deficit will be over 5% in 2014. In a speech last week, Hollande talked about how France will have full employment, a third industrial revolution, and affordable housing within 10 years. Social justice will be achieved, and climate change will be dealt with. There was a lot of happy talk about how wonderful the future will be but not many details on how to get there. At some point the market will no longer be content with happy talk: it will demand action. That action is going to be difficult to produce, given the internal politics of France. The decisions France makes, along with those of Germany, will determine the future of the euro experiment. And the situation is not as simple as asking whether France will get its fiscal house in order or whether Germany will write a check. This scenario would require members of the Eurozone to give up a great deal of their fiscal autonomy to Brussels. This will become the central question with regard to the existence of the euro within a few years. In an odd sort of way, the Eurozone is going to enter into its own internal currency war as the peripheral nations continue to have debt problems. The situation will be exacerbated by the fiscal crisis that will soon engulf France. It will come precisely at the moment when Germany will be asked to allow the ECB to accommodate the French bond market, as it has done for Italy and Spain, and when France will in turn be asked to enter into a period of austerity, as both Italy and Spain have done (very painfully). It is at that moment that the ultimate survival of the euro will be decided. While I do think the euro will survive, I have to admit that I'm not strongly convinced of it. The euro has never been a truly economic currency; it was created as a political statement, and is a political currency. The problem for Europe is that a currency union ultimately requires a fiscal union. Just as the various states within the United States have to balance their budgets, that is what might be required of countries that are part of a European fiscal union. Given that most of Europe has entitlement-spending problems just as severe (or worse!) than those of the US, there will not be a European fiscal union without a great deal of political contention. Will Germany be willing to pick up the tab for the rest of Europe, given the serious fiscal constraint that will impose on its own budget? Will France be willing to give up control of its budget process to Brussels? These are the questions on which the future of the euro hinges. Let me remind those of you near Dallas that the world premiere of the blockbuster documentary on the Federal Reserve, Money for Nothing, will be Friday, September 6, at 7:30 PM at the AMC theaters in Northpark Mall in Dallas. You really don't want to miss this. You can't buy tickets online until seven days before the event, but I think there is a reasonable chance they will sell out. You can see a trailer by clicking here and learn when the movie is coming to a city near you, or you can arrange for it to do so by going to www.MoneyForNothingTheMovie.org. I hope you can join me at the world premiere in Dallas. It will be a special evening. On Tuesday, September 10, in Chicago, I will be joining my longtime friend and partner Steve Blumenthal to present my most recent thoughts on the economy, the Fed, and the direction of interest rates and their impact on the economy and equity markets, at the Trinity Financial Advisors Investor Forum, hosted by John Wimbiscus. The Forum will be held at 6:30 PM at the Gleacher Center of the University of Chicago, located at 450 North Cityfront Plaza Drive, Chicago, IL 60611. Please contact Linda Cianci at linda@cmgwealth.com or call 610-989-9090 x140 to reserve a seat. I hope to see you there. I will be traveling from there to Bismarck, North Dakota, to delve deeper into the Bakken shale oil boom and to speak for BNC Bank on September 12. My great friend Dr. Lacy Hunt will also be presenting. If you are in the area, you should plan to attend. Then I will be in Denver with my partners at Altegris Investments on September 19 for a presentation to clients and prospects before flying to Toronto to be with my good friend Louis Gave for a morning seminar on September 23. Please note that two weeks ago I said that seminar was in August, so I created some unnecessary confusion initially. If you would like to attend, you can register at http://gavekal.com/seminar.cfm or contact Chris Lightbound with any questions. From Toronto I will fly on to New York City for a few days of media and meetings. It is my oldest son Henry's birthday next week, and the family will gather tomorrow to celebrate. Next weekend I'm off to San Antonio for WorldCon, the science fiction book convention, which will serve as my end-of-summer celebration. I'll enjoy a few days of exploring fantasy and the future with people whose words have entertained and inspired me over the decades. In the meantime there are a hundred items in my inbox that must be attended to. And I'm really trying to get into the gym more, so every day seems to be full. Have a great week and enjoy the rest of the summer. Aug. 26, 2013, 2:04 a.m.
Stop relying on Google Translate, it’s crap. Real translators work for very little - hire one if you need to understand something in a language you can’t read. Of course Moschetto did not write “France is not and will not bankrupt because it would then be in a state of insolvency.” Here’s a better translation, which I give you for free: “France is not and will not be bankrupt, meaning unable to pay its debts.” He’s just explaining what the term “bankruptcy” means. He goes on to say why he thinks a State which has an unlimited power of taxation cannot become unable to pay its debts, unless those are mainly in a foreign currency, which France’s aren’t. One can disagree, but his article is not the silly nonsense which came out of Google Translate. Your articles would probably seem equally silly if you used Google Translate to put them into French. Aug. 25, 2013, 6:36 p.m. I wonder if the commitment that the European political class feels for the Euro might be based on a now outdated notion of the problems associated with the economic inefficiencies relate to the various currencies. The Euro was conceived at a time when the proliferation and capabilities of mobile devices and the internet was beyond the imagination. For internet purchases in a Europe having several currencies, one would indicate the transaction currency of choice, say EuroF for the French, and all prices would be displayed in EuroF. For shopping, each item could carry a barcode tag or wireless price tag that one would scan with a smart phone and read the price and pay in the currency of choice. Even restaurant checks could be paid via the phone. Me thinks they are clinging too hard to a lost cause and the biggest cost of change will be chagrin, not economic collapse. Aug. 25, 2013, 3:28 p.m.
Aug. 25, 2013, 2 p.m. Very interesting and conversation-provoking, as always. But really? If Illinois and California are the benchmarks, France can run this a long time, yet. My California is busting its buttons over the current budget, forecasting a tiny surplus. I will bet anyone nearly any amount that the deficit will return, with teeth. So I’ll reserve enthusiasm for a European solution along the lines of “must balance budget”. Aug. 25, 2013, 12:13 p.m. Please allow me to share with you some thoughts on the Portuguese crisis and the way to, maybe, get out of it. Portugal has (almost) reached a foreign trade balance and its budget deficit is now around 4%. If Portugal places the whole debt needed to cover its current budget deficit with Portuguese investors, there would only be an increase on foreign debt as a result of high interest rates. But if you ignore the interest on debt, a balanced trade and an internal financing of current budget deficits would guarantee that Portugal could be able to meet its obligations, provided there would be no change on trade balance and no increases in budget deficits. In other words, risk of default would be almost zero. Therefore it would be acceptable to reduce interest rates to present German levels, which would eliminate the risk of an increase in the debt to GDP rate. In other words, the situation would be balanced and any growth would contribute to a progressive reduction of debt to GDP. Portugal would be out of the woods. To consolidate this, I would advise a moratorium of one year on the payment of interest to foreign creditors, and use that money (about 8 billion euro) to generate a Marshall Plan-like programme of investment, which would strengthen Portuguese competitiveness. In this manner no haircuts would be needed and Portugal would slowly start to recover. Cost to creditors? A significant reduction in interest income from Portugal’s debt, which would seem a small enough price to pay for Portugal to become solvent again.